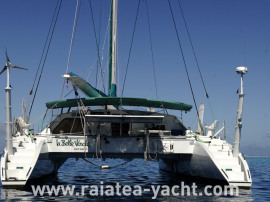 Tax not paid for French Polynesia. 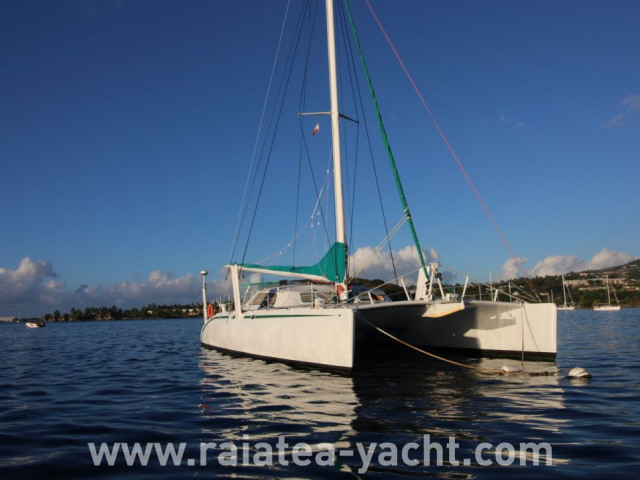 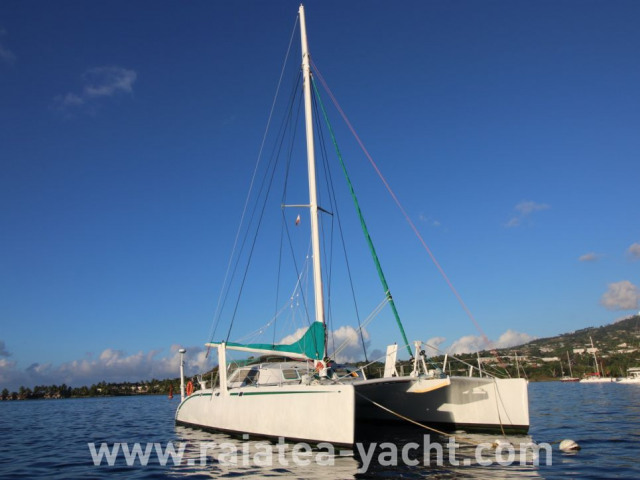 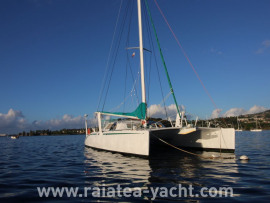 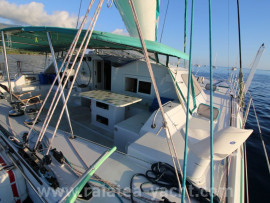 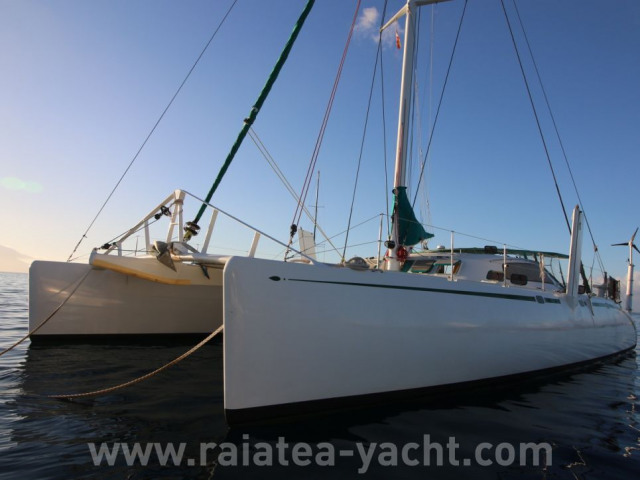 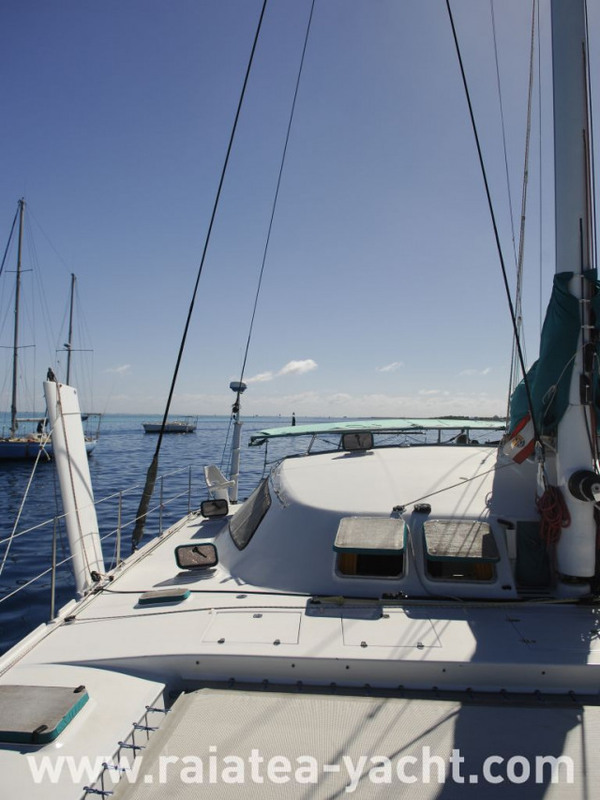 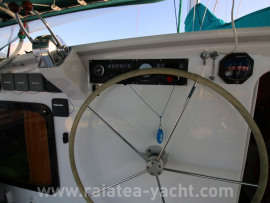 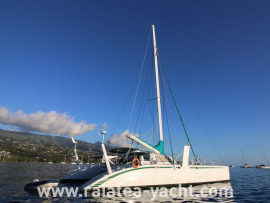 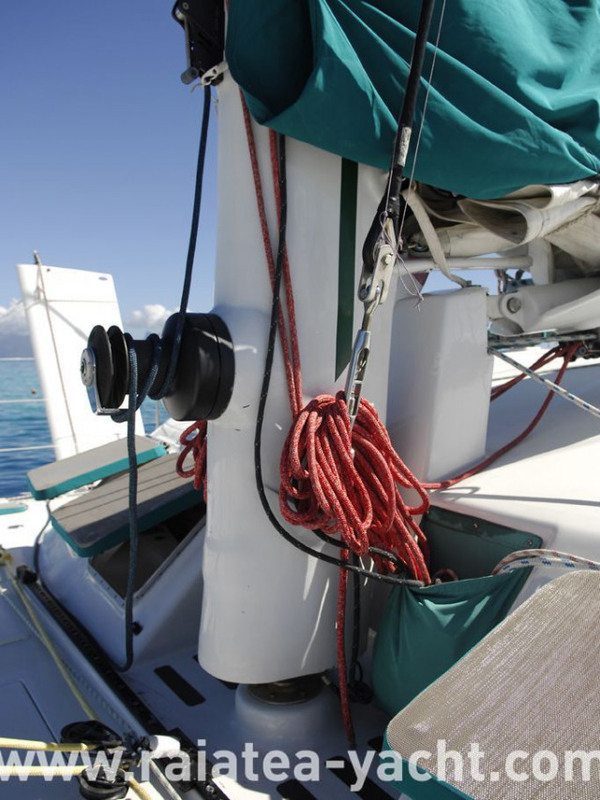 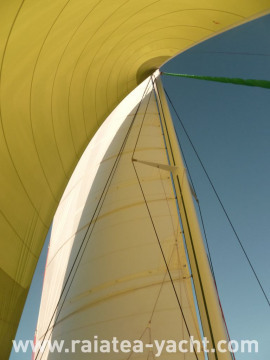 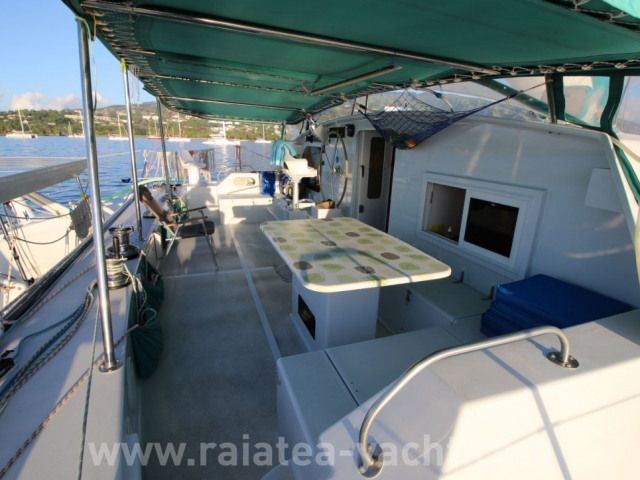 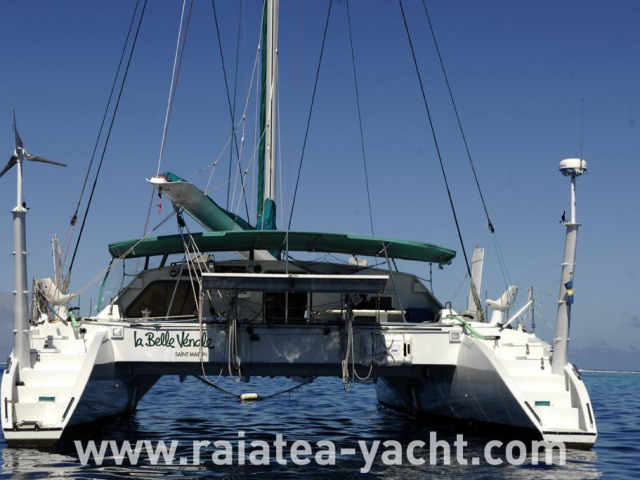 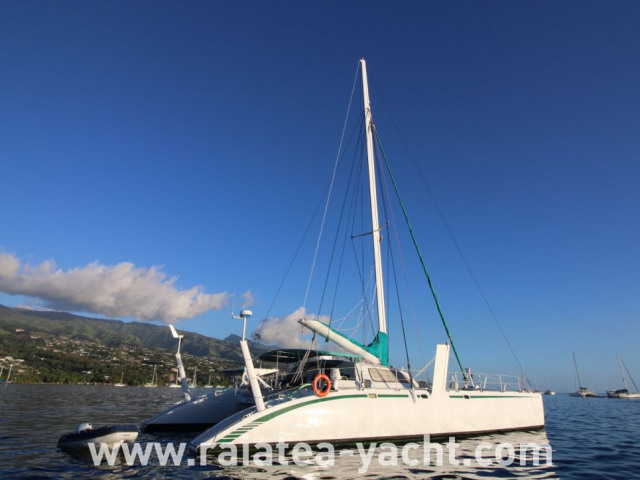 Light and fast outstanding catamaran, comfortable at sea, large and pleasant to live. Inside fittings are achieved as efficiently as possible, in saturated epoxy plywood (2 layers). 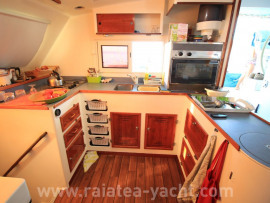 Cherry wood fields, chart table veneers, saloon table, drawer front and door storage. 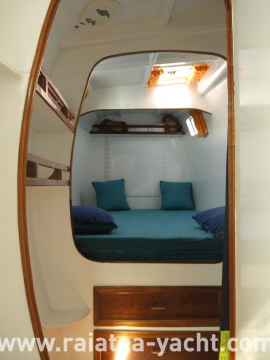 Apertured doors for good ventilation. 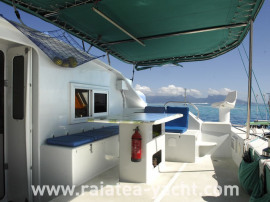 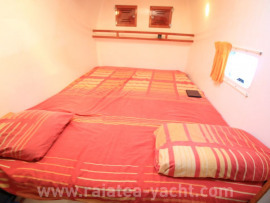 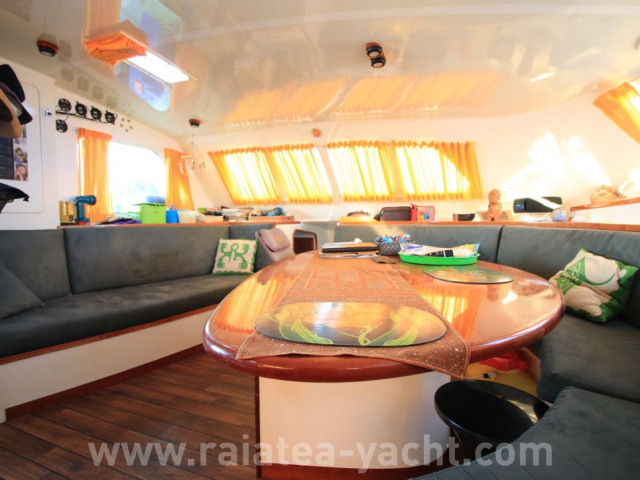 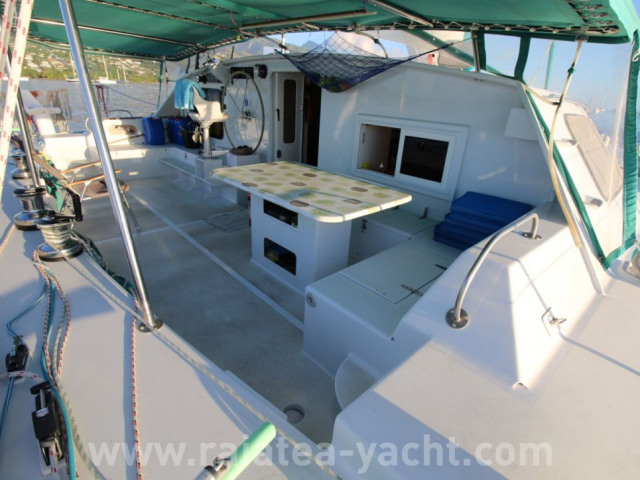 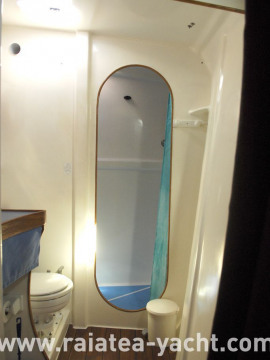 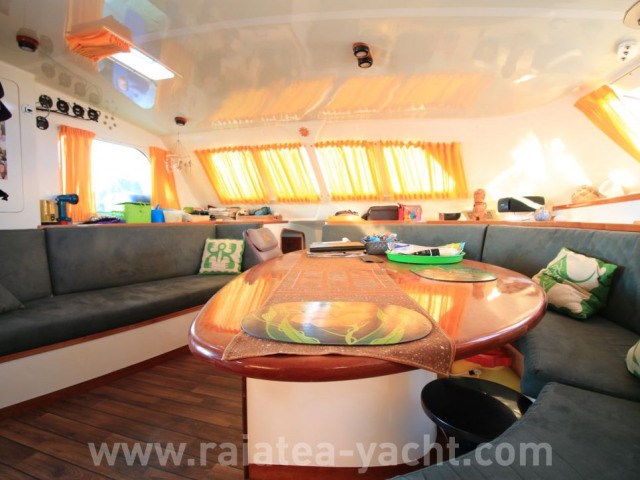 -double cabin, bathroom with washbasin and toilet and seperate shower. -central bathroom with shower, washbasin and toilet. 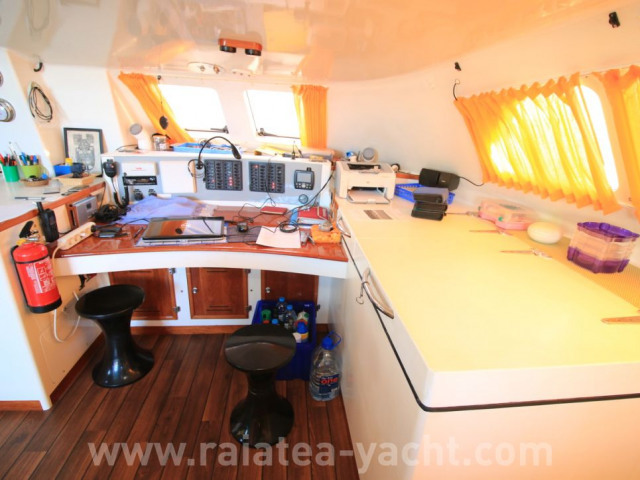 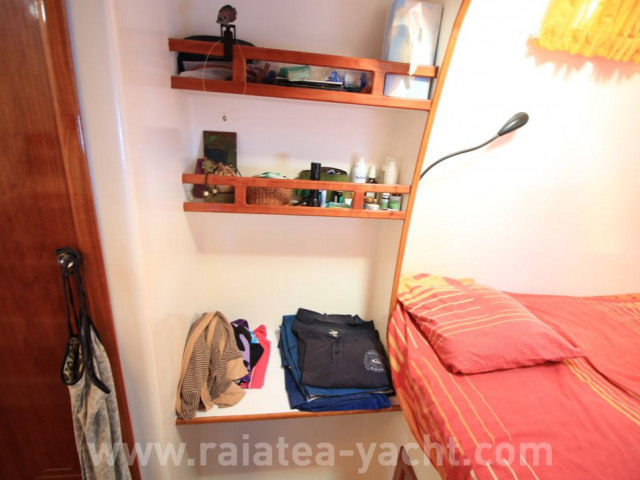 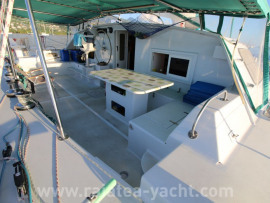 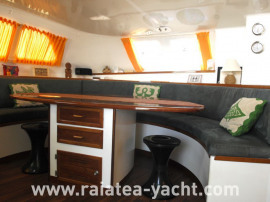 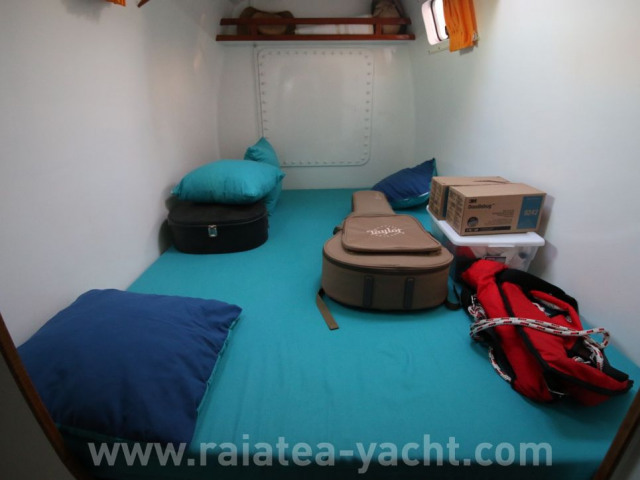 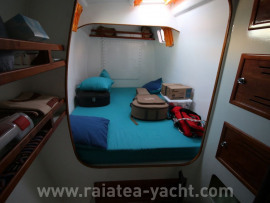 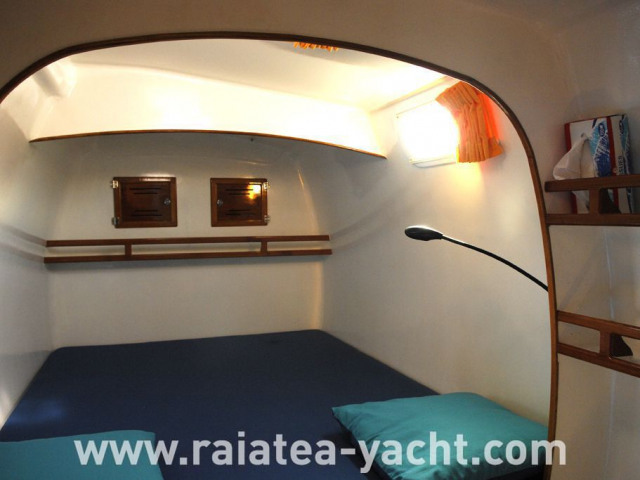 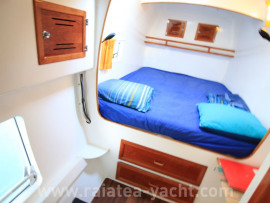 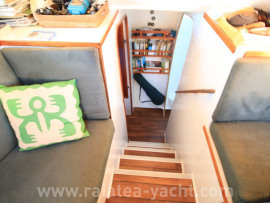 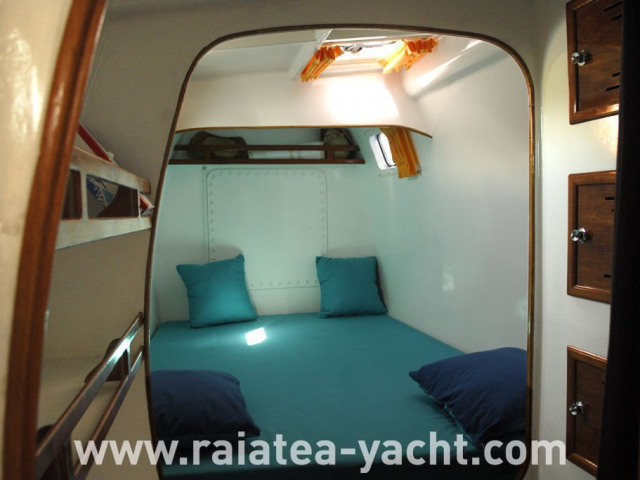 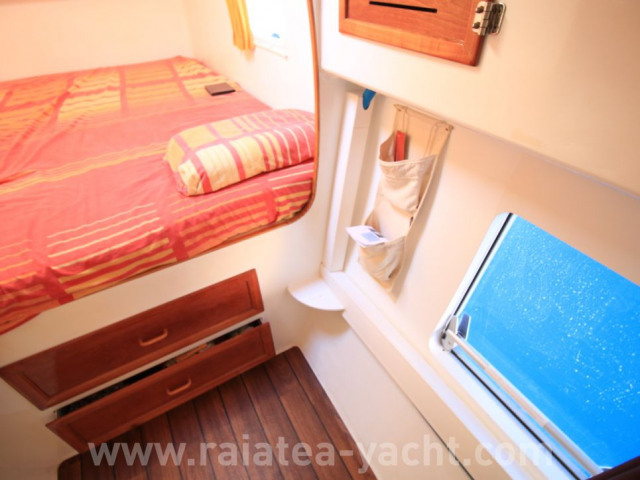 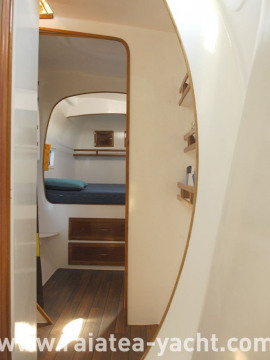 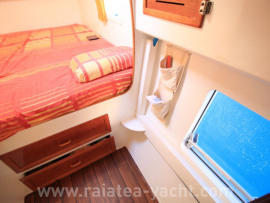 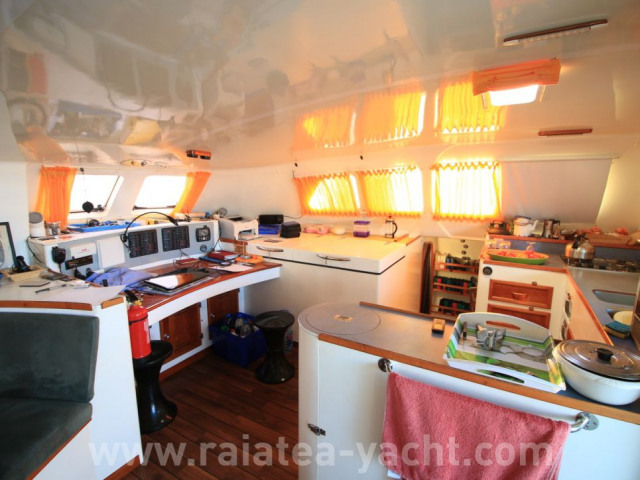 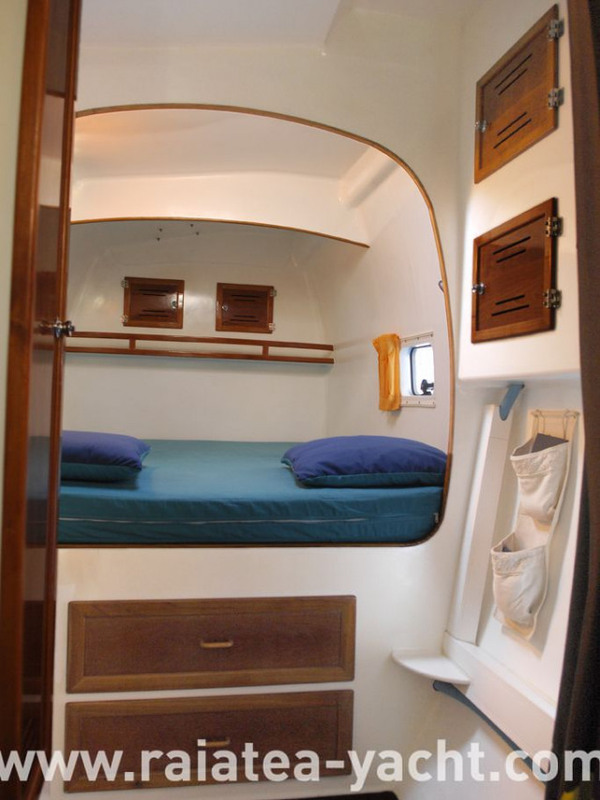 Wardrobe, bench, storage and large drawers under bed in each aft cabins. 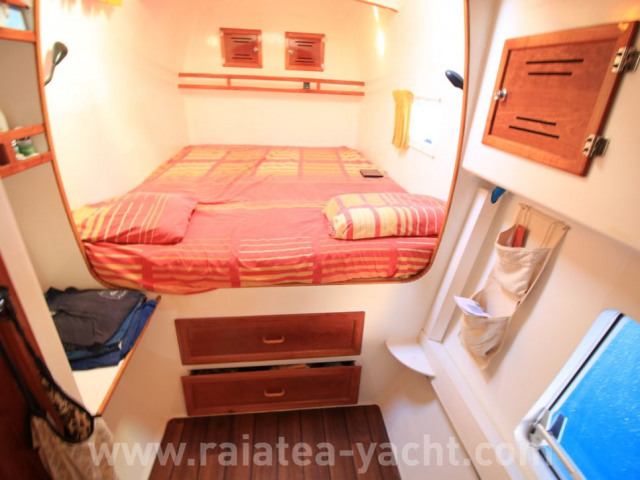 Many storages and large drawers under bed on double cabin fore. 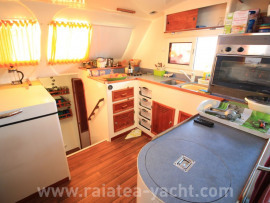 -U-shaped saloon with stove, sink, built-in oven, drawers, crisper, work plans, built-in trash, bar and storages. 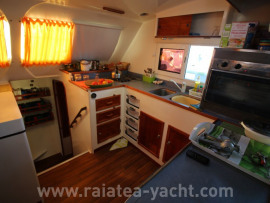 Fridge and deep freezer on starboard with top opening. 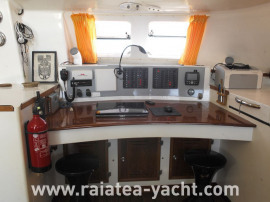 Large chart table with top opening and built-in navigation instruments. 8/10 persons saloon table with 2 drawers and storages. 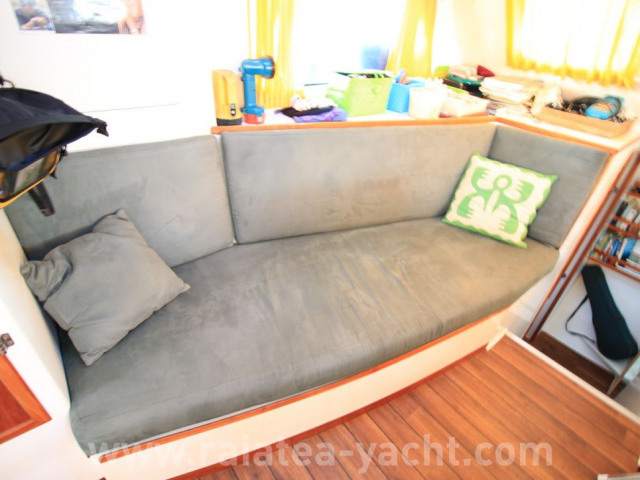 On port, sailing bench with storage box and wardrobe. Equipment room (deck access with 70x70 deck hatch): workbench with vise, storage and water maker location. 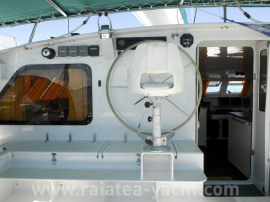 Engines location: under rear beam with deck hatch access. 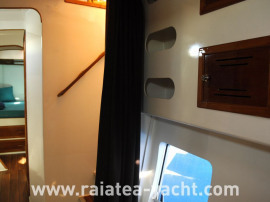 Back strabord engines room: ropes compartment. Back port engines room: autopilot compartment. 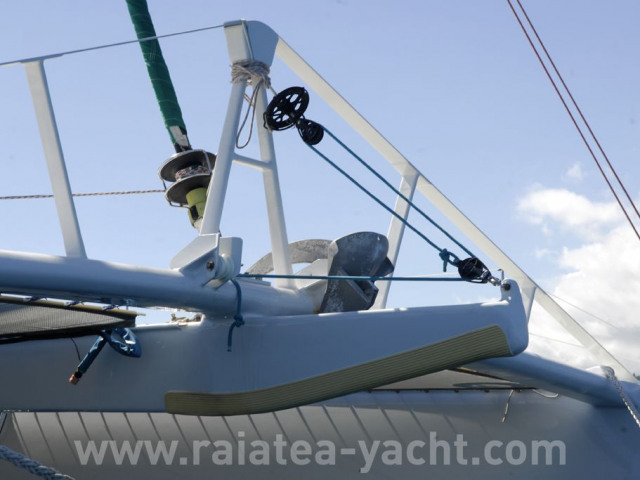 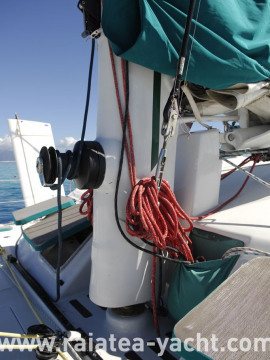 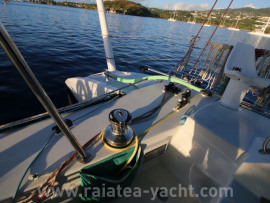 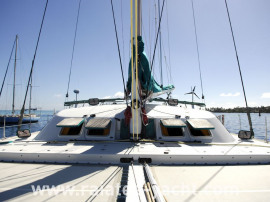 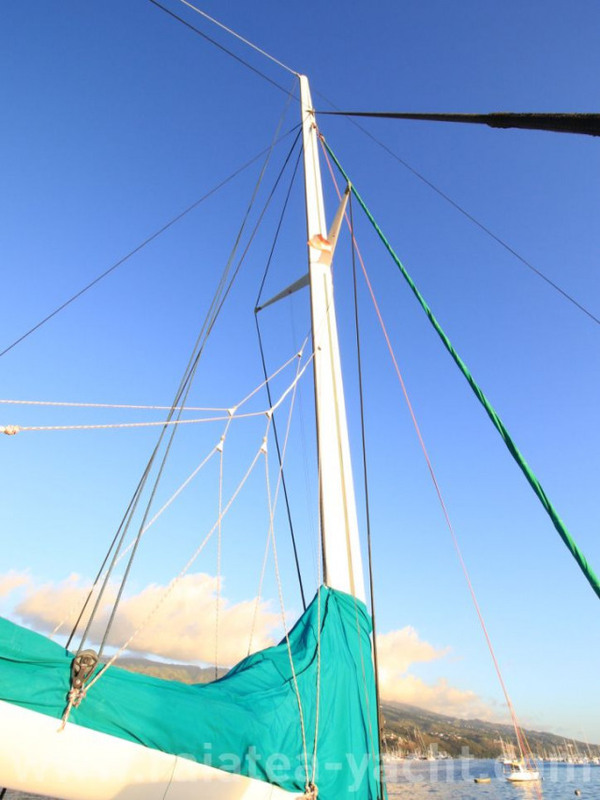 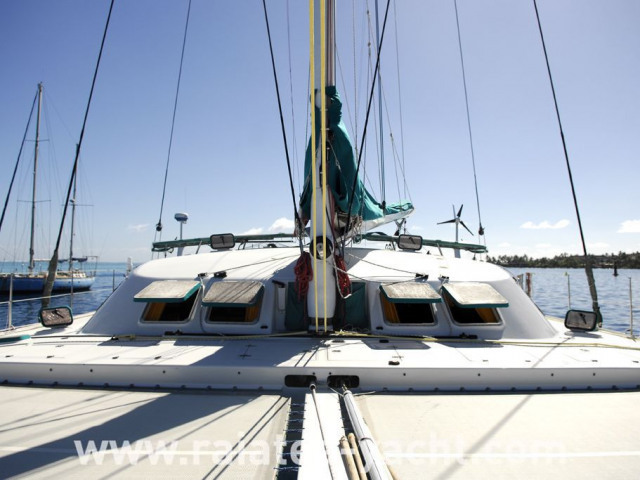 Catamaran LOOPING 60' type, strip-planking, built between 2004 and 2012 by owner in West Indies Caribbean, design by Patrick Luscher. 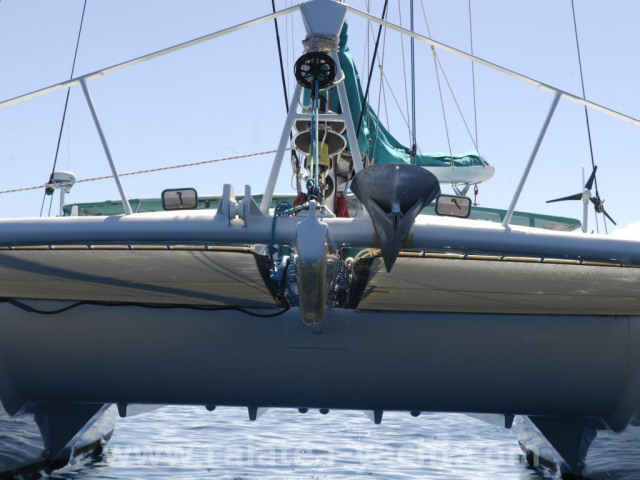 She is, as in all LOOPING range, intended for the oceanic wandering in family. 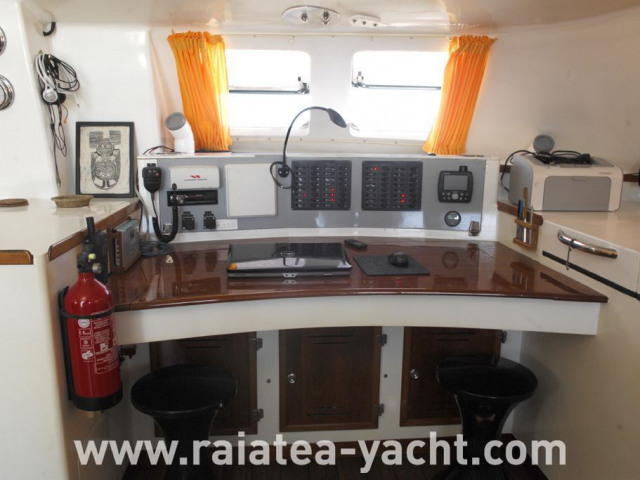 3 double cabins and technical rooms. The weights are centered at the most to avoid the pitch. 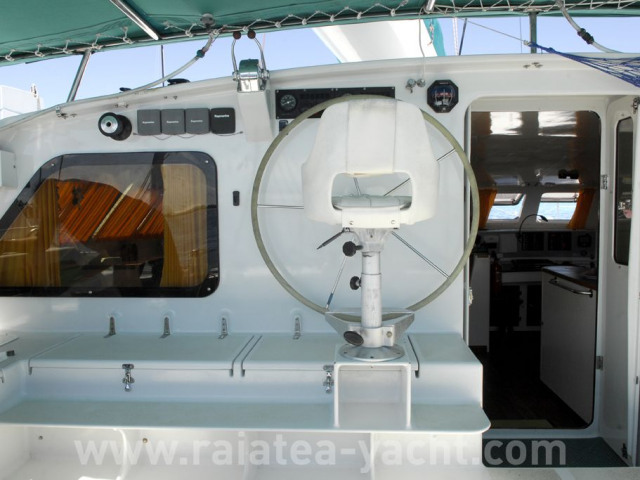 Empty fore peck and aft platform gives a boat weighing half of most of the others 60 '. 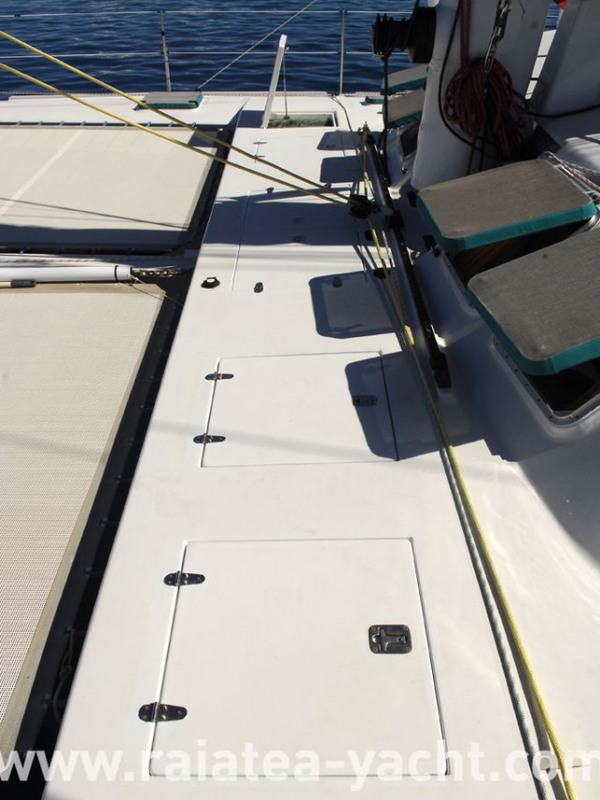 Particularly looked and accurate, building is in a constant effort to improve performance and product quality. 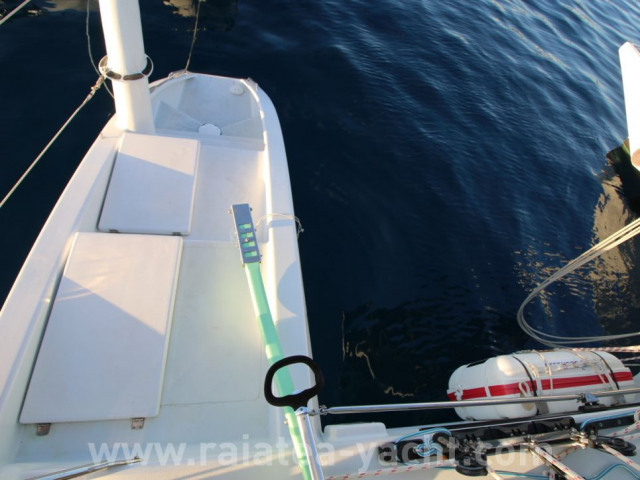 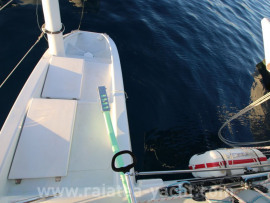 (Carbon wing mast, carbon dolphin- striker, daggerboards). 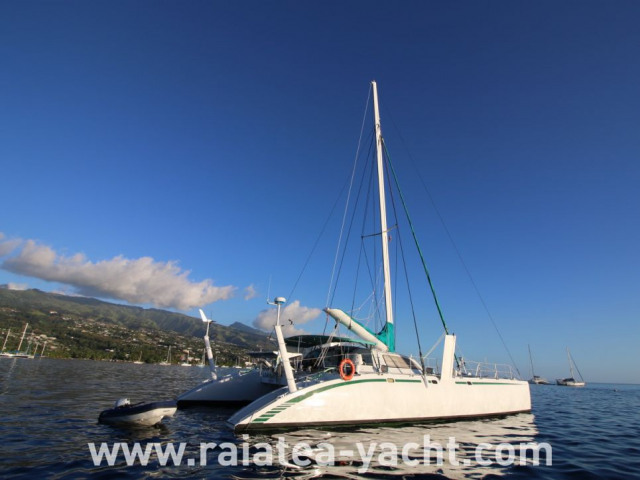 Generous and bright volumes, very reassuring and comfortable catamaran, aesthetic fluidity and simplicity. Horizontal engine on drip tray, angeled reverser, flexible coupling, shaft lines, rotating joints PSS, 3-blades propeller. 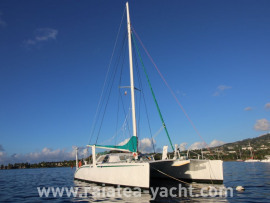 Outstanding catamaran, unique on the world! 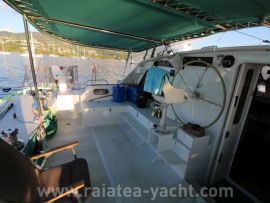 Ready for blue water sailing!